Jewish cooking spans the globe and anywhere Jews live or have lived they have adapted local dishes to suit their own styles, tastes and dietary laws. 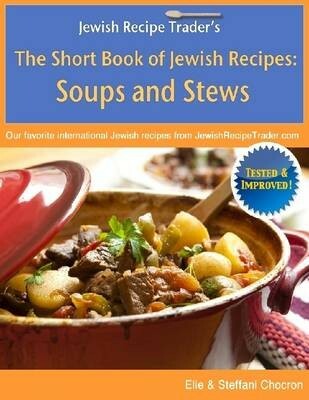 In this recipe book, you’ll find a variety of kosher recipes that reflect the global nature of Jewish cooking. • Sephardic Style Matzah Ball Soup for Passover. This recipe includes vegetarian Albondigas (meatballs) made with matzah meal and walnuts. To American and Ashkenazi Jews, this is both familiar and distinct. • Beef Goulash With Couscous. Is it Hungarian with a Moroccan influence or Moroccan with a Hungarian influence? • Beef Stew with Green Herbs. This was originally a Persian-Jewish dish, but was prepared by Italian Jews for Passover using Sephardic Passover customs. One can almost imagine this stew traveling from Persia, to Spain to Rome. We hope you enjoy our 36 (double-chai) recipes and the brief history associated with many of the dishes.